We share with you our best pieces on the assessment and the prescriptive training. Having an assessment by a skilled Athletic Trainer or Physical Therapist can complement what you learn from our site. 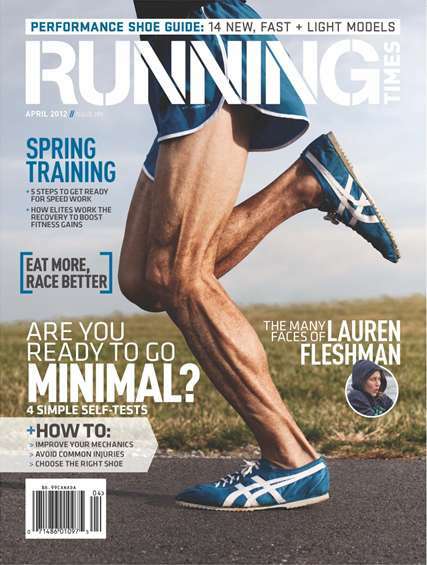 April 2012 Running Times recreates the iconic image on Jim Fixx’s 1977 The Complete Book of Running. I am running in the same shoe as Fixx, a 1968 Onizuka Tiger. The goal of our article is to help any runner make a safer transition to better running form and reduce the amount of shoe they need. With the simple tests and corrective exercises we describe you can self assess whether you are “Ready for Minimal”. Don’t despair even if you do not pass all the assessments. Start slow and with progression you will be able to adapt. View this really well done video by Joel Wolpert featuring Jay Dicharry, triathlete Nicole Kelliher, and myself on some simple self assessments for minimal running. The video complements the Running Times Article. You can’t fire a cannon from a canoe. There is no place this is more true than in running. To run efficiently and without injury you need a strong, stable, and mobile base. A tough combination on unconscious movements that take place with every running step. The web is loaded with videos on core training, stretching, strength work, and supplemental work. Most runners though fail to put these videos in context for what their individual needs are. Many videos out there focus exclusively on the running form, but without the “chassis” issues supporting the more natural form it will be difficult to transition safely and optimally. So why is our video different and worth viewing? This video is targeted to you as a runner trying to learn better form. It will help you identify weaknesses and restrictions in your kinetic chain and give you some simple corrective exercises you can do at home. These exercisers are taught and practiced by us, so we know they are easy to learn and effective with minimal time investment. Thanks you to my friends and colleagues who are skilled educators and experienced athletes- Athletic Trainer Laura Bergmann and Physical Therapy student Brad Dodson. Sarah Young and Jenn Pilotti share with you an amazingly simple and evidence based series of articles on Glute Function and Retraining. Follow there assessment and prescription for a smarter behind! As Jay Dicharry describes in his book “Anatomy for Runners”….it is all about the booty.